Patio designs come in all shapes, sizes, and materials. They can transport you to an Italian villa, the French countryside, or the Caribbean islands. Patios add value, create a seasonal extra room in your home and are a source of pleasure many months of the year. It can be hard to choose from all the ideas, materials, and combinations available if you don't have an idea of what you want and need. How big do you need your patio to be? How much entertaining will you be doing? Are there any special design details that will make a difference in the size you need? If you plan to have a bar then you will need room for seating and traffic flow, for example. Keep these types of details in mind. Will you want a fountain or a koi pond? Lighting can add ambiance. Solar lights make a number of looks possible. Will you use it mostly at night or in the day? Plan the amount of light to coincide with what you will be doing. If you will be playing card games, you will need more light than if you will be chatting under the stars. Lines add interest. Create a casual, romantic look with graceful, curving lines or a more formal look with straight lines and angles. Is there a place in your yard that has a spectacular view? This might be the best place for your patio. If you have an existing patio, make sure that there is nothing that blocks the view you do have. How much money do you have to spend on this project? If finances are limited you will need to keep a careful eye on your patio design. In some states you may be able to get grants and special loans to defray some of the costs. The weather patterns in your area can make a difference in how much time you spend on your patio. Think ahead and plan for various types of weather. Depending on the angle of the sun you may want to consider a sunscreen in addition to a roof. Everything from rooms to paintings needs a focal point. Your patio does, too. A pool, hot tub, outdoor fireplace or even a set of chairs can work as a focal point for your patio. Ideas can be sketched out or written down as they occur to you and sifted through at a later date. Your patio should complement the style of your house. If you have a Queen Anne Victorian then a Mediterranean patio is going to look a little odd. When you are planning features like furniture and accessories, keep the overall style in mind. Design elements can create whatever you can imagine. You can place garden areas within the patio itself or add statuary or a fountain. Create a peaceful Japanese garden by adding a quiet koi pool. How you use plants in your patio design will have an impact on the total look of the patio. Use plants of different sizes, and use different heights in the planters and pots. Vary the colors and shape of the foliage for interest. Plan carefully for shade trees, but also be aware that falling leaves can make design elements like a pool hard to keep clean. The landscaping should complement the entire look of patio and house. Very casual gardens are at their best in a cottage style setting, whereas tropical plants may look wonderful in a Mediterranean style home. Spending the afternoon at the library looking through gardening and home improvement magazines may give you some valuable insights and ideas. Having accessories on your patio can take it from average to amazing. Things like fireplaces, outdoor kitchens, and bars make your patio work for you. Plan these accessories early in your design process so that you can make sure that there is sufficient space for seating, walkways, and statuary. Add visual interest with interesting items and colors. Bring different colors in to set the mood as well as add continuity from house to patio. You can use the construction materials, as well as the landscaping and accessories to add color. Adding a bird bath near the patio will also add visual interest as the birds come and go. Statues can add different levels to keep the eye moving through the landscape. Fountains add not only visual interest but they provide soothing background noise. Looking through decorating and gardening magazines are great ways to get inspired. The more patio designs you look at the more ideas you are likely to get. A quick trip to the local library will supply you with plenty of patio design books to look at. Once you have your ideas you can get a computer program to create it in 3-D. Looking at hundreds of patio designs can be confusing. Take some time and think about what aspects of each patio you like the best. 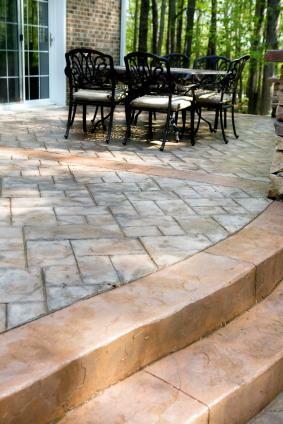 Create your own patio from a mixture of the things you love in each design with consideration to your own needs. Having a beautiful patio is like adding a room to your home. Make it an area that you will love being in, your own private retreat.